Gallery open until 7pm on Wednesdays through the duration of the exhibition for nighttime viewing. Get This! Gallery is pleased to present A System of Interiority by Gyun Hur. This is Hur’s second solo show with Get This! Gallery. Hur has received wide acclaim for her floor installations comprised of hand-shredded silk flowers. In this exhibition Hur presents a new aesthetic direction in her construction of visual and psychological space. 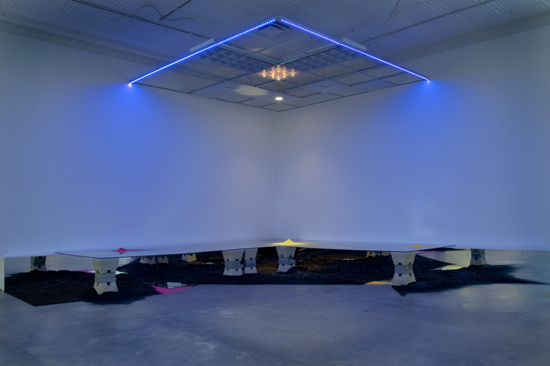 The collaborative installation engages lighting designer, Rebecca Makus and writers, Kristin Juarez, Lilly Lampe, and Ruiyan Xu. The exhibition includes a collection of objects and materials including powders, silk flowers, dirt, and broken pots. These objects will be laid on to multiple platforms around the gallery space, which include a cement floor, glass floor, and a light panel. The writers’ texts that explore ideas of interior will be installed on the gallery walls. A System of Interiority invites the viewer to experience the installation over time as the light changes – this transformation of space is an essential part of perception and understanding of surroundings. This collaborative installation will continue Hur’s ongoing narratives of loss and rupture. The exhibition is a provocative exploration of materials and lighting that are intended to facilitate dialogue about the notion of psychological, interior space. Gyun Hur has performed and exhibited in Atlanta, New York City, Chicago, Seattle, Hong Kong, and Turkey. Gyun’s work has been widely recognized for her floor installations comprised of hand-shredded silk flowers that evoke a sense of labor, loss and memories. 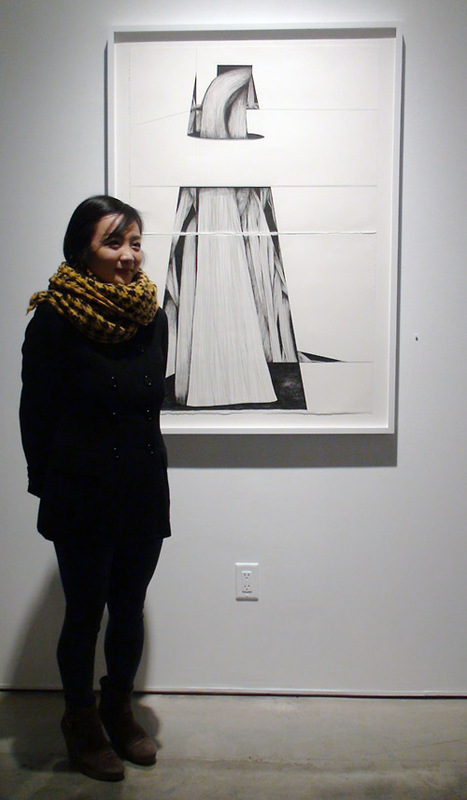 Gyun is the recipient of The Hudgens Prize (2010), Artadia Award (2011), and Joan Mitchell Foundation Scholarship (2010). Her works have been featured in Art In America, Art Papers, Sculpture, Atlanta Journal-Constitution, Pelican Bomb, Creative Loafing, Jezebel, and The Atlantan. She was listed as the Best Emerging Artist (2011) by Creative Loafing and selected in Oxford American’s “100 Under 100: Superstars of Southern Art” issue. Her interest in art making in public space led her to various artist presentations and projects with the TEDxCentennialWomen, the international street art conference Living Walls: The City Speaks, gloATL’s Hippodrome, and many others. Gyun attended the University of Georgia (Painting, BFA) and Savannah College of Art and Design (Sculpture, MFA). She currently lives and works in Hong Kong. 애틀랜타 출신으로 주목받고 있는 1.5세 재미화가 허견씨가 지난 4일(토) 생애 두번째 애틀랜타 개인전을 열었다. 허씨는 ”대학원 졸업했던 2010년에 첫 개인전을 열고 4년 동안 개인전을 하지 않았기 때문에 이제는 해야겠다는 생각으로 1년전부터 계획했던 전시회”라고 설명했다. 사바나미술대학 홍콩분교에서 교편을 잡아 지난해 9월부터 홍콩으로 거처를 옮긴 허씨는 그곳 생활에 대해 “어른으로 다시 아시아에 가서 적응하는 것도 좋고, 하고싶은 일 지금 하고 있는 것도 좋고, 그곳 미술시장도 활발해서 좋다”며 “애틀랜타랑 너무 틀려서 쉽지는 않지만, 좋다”고 말했다. 이번 전시회에 대해 그녀는 “지난 3-4년간 색동으로 하던 작업을 마무리하고, 이젠 진짜 내면 속의 이야기를 하고 싶어서 조명 작가 선생님과 친한 작가 몇 분과 같이 ‘글’(Writing Text), ‘조명’(Lighting), 그리고 제 ‘설치’(Installation)를 다 합해서 콜라보레이션 작업을 한 것”이라고 설명했다. 지난해 내내 ‘물이 쏟아져 나오는 이미지’를 스케치하고 있었다는 허씨는 이번 전시회에서도 4개의 물 흐르는 그림들과 벽에는 글이 쓰여져 있고 천정에 조명을 달아 비추는 설치작품을 전시하고 있다. 허씨는 “제 설치(작품)로는 표현할 수 없는 흐름(Flow)을 그림으로 설명하려고 그린 것”이라고 말했다. ‘내면의 시스템’(A System of Interiority)이란 제목의 이번 전시회는 오는 3월1일까지 벅헤드에 위치한 갯 디스 갤러리(Get This Gallery)에서 펼쳐진다. 허씨는 중학교시절 도미해 사바나 미술대학을 졸업하고 애틀랜타는 물론이고 전국적으로 활발한 활동을 펼쳐오고 있으며, 지난 2011년 허진스 미술센터 공모전에서 대상을 받으며 주목을 받은 바 있다. ▲지난 4일 개인전 ‘A System of Interiority’를 연 화가 허견씨가 자신의 그림 앞에서 포즈를 취하고 있다.